This dish was the solution to a Cafe Miranda problem. 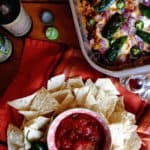 We all love nachos (who doesn’t love nachos? ), but we couldn’t make them in our wood-fired oven. It turns out that 800°F/427°C will combust your chips. So we came up with this deconstructed way of eating them: beans and cheese in a casserole, with chips to dip in it, salsa on the side. Our customers wanted to know what the staff was eating back there, so we had to start sharing with the public. If making chips: Cut the tortillas into chip-size wedges. Fry until crisp in vegetable oil heated to 350°F/177°C (if the oil is smoking, it’s too hot). Stir to keep them from sticking together. It will take about 5 minutes. Drain on paper towels. Squeeze the lime over the chips, whether you make your own or use a bag. Spread the ragout (see note) in a 9-inch/23 cm oven-safe casserole dish. Top with the Cheddar, ricotta and the oregano sprig, then cover with the mozzarella. Place the poblano pieces around the edge of the casserole, shiny side up. Sprinkle the onion over, and artfully place the jalapeño halves on top. Brush the vegetables with cooking oil. Place the casserole under the broiler for about 5 minutes, until the peppers are a little charred, the cheese is bubbling and the beans are hot. Serve hot (use a trivet!) next to a plate of chips and a bowl of salsa. To make the black bean ragout, heat 6 tablespoons vegetable oil in a medium pot over medium heat. When it begins to shimmer, add 2 tablespoons minced garlic and stir until it begins to turn golden. Add 1 rib of celery and 1 medium onion — both diced. Cover and sweat them over medium heat until translucent and sweet, 10 minutes. Put in 2 cups dried black beans, 3/4 teaspoon dried oregano and 2 bay leaves. Cover with water. Simmer on low heat, stirring regularly, until the beans are tender, which may take 2 hours or so, depending on your beans. Keep the beans covered with liquid, adding more water as needed. Don’t make it too soupy; you want a substantial stew in the end. When the beans are thoroughly tender and the liquid has thickened, add salt and pepper to taste.